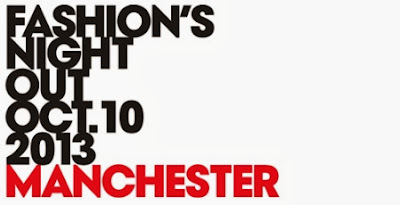 With just a few more days until the fash pack descend on Manchester for Vogue Fashion's Night Out on Thursday, I thought I would try and find out what exactly we have to enjoy on the 10th in our fine city! Apologies if I miss anything - there's just so much going on! The main FNO areas are; Manchester Arndale, Exchange Square, Spinningfields, King Street and St Ann's Square. Most of the retailers in Manchester will have *something* going on with many having special #VFNO discounts available to shoppers on the night. Selfridges and Harvey Nichols are holding a variety of events in store, with Selfridges playing host to designers Erdem and Henry Holland and Jameela Jamil on the decks providing the musical entertainment! There will also be MAC makeovers and Chanel manicures on offer to shoppers and you can take your very own Selfridges 'Selfie' in their Photo Booth! Harvey Nichols are celebrating their 10th Birthday so there will be treats galore to shoppers visiting the store! It is also worth noting you can have your official Vogue FNO t-shirt customised by ten of Harvey Nichol's favourite designers! Manchester Arndale is also getting in on the action with many of the retailers putting on their own shopping events, along with a giant tweet wall so that visitors can get involved in the #FNO conversation! House of Fraser are rolling out the red carpet and have built a pop up Fashion Night Out Cafe in Ciccetti with Head Chef Aldo Zilli taking the reins. There will be Dior makeovers and a chance for shoppers to pose for a celebrity style photo shoot, and take home their glam photo as a memento of the night. Gap will be serving american food and drink for all customers at Gap on FNO. The store’s style spotters will also be roaming Manchester city centre looking for the best FNO looks that are working a 'cool casual American style'. Those ‘cool’ enough should visit the store where The Mancorialist street style photographer will be capturing shoppers. Gap will also be selling the Vogue FNO t-shirt (£18) on the night. Blogger/DJ Bip Ling will be in charge of the tunes at the Ugg Store on New Cathedral Street, and the ‘as seen in September Vogue’ innovative pop-up restaurateurs will be keeping the food and drinks creative. You’ll also have the chance to win Bip Ling’s UGG Australia AW13 edit on the night.